The Zoomershow is for Baby Boomers in Canada who stay active and 'seize the day'. This is Canada's largest Lifestyle Expo for people over the age of 45 who still look and feel healthy and who live their lives looking for new challenges and ways to help others help themselves. This was the fifth annual Zoomershow, because five years ago someone had the idea to wrap a trade show around the notion of active Baby Boomers who are NOT retired but working towards their Golden Years with a maximum of energy and enthusiasm. Last weekend, October 27, 28 of 2012, the 5th annual Zoomershow consumed the Direct Energy Bldg at Exhibition Place and even Hurricane Sandy which was bearing down on Toronto could not keep fifteen thousand people from attending this exciting event. 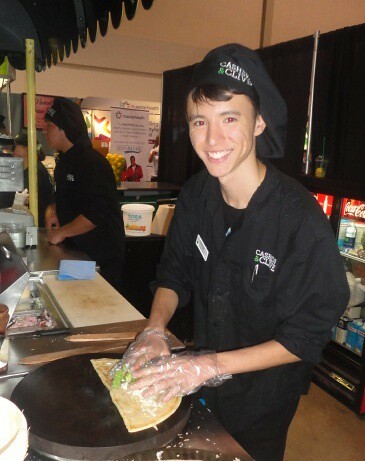 If it's hot and it's important, and if it can benefit people age 45+, then it’s welcome at the Zoomershow! 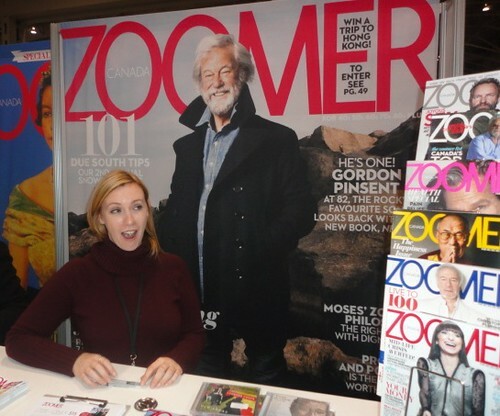 The Zoomer magazine booth wih its giant poster of Gordon Pinsent on last month's cover enjoying his retirement on the rocky Newfoundland coast was a definite focal point of the show. It was also the best place to subscribe to the magazine at great discount and register to win a trip for two to Hong Kong at the same time. There were over two hundred and fifty exhibitors at the show; the exhibition hall was divided into six or eight different sections and these provinces all had a mini stage or main attraction inside their color coded borders. This show was well laid out considering it was a very diverse assembly of goods and services covering several different aspects of modern life, including health, exercise and food, travel, relationships and money, investing and personal finance. Dr. Natalie Archer DDS was a prominent figure in the health science booths. She was handing out special toothpaste for sensitive teeth called Sensodyne and bonding over interactions with attendees. Dr Archer is a media savvy health care practitioneer who has two different clinics in Toronto and makes frequent appearances in women's magazines and is often profiled in small business journals. She is the brains and the brawn behind the Open Wide Group and its a well known fact that she helped judge the Miss Teen Canada - World beauty pageant last year and yet by contrast she's one of Toronto's longest serving seniors' dentist at Runnymede hospital on the west end. The show personal trainer, and Max Abraham who is a fitness instructor that makes action packed workout videos free for the web. There was a flamboyant Toronto roofer with a huge booth that was kind of shaped like a roof. And a cosmetic surgeon named Dr Cory Torgerson was giving away discount Botox injections while twin girls were doing an exercise routine that I couldnt take my eyes off. Melani Chong the fashion model and mother of two was dispensing samples of her latest all natural skin care product. At the Optical shop I got free +2 eyeglasses and I love them - I take them with me everywhere to read menus and racing programs and travel instructions now. At the far west side of the Direct Energy Bldg there was a large sound stage and stacks of speakers and three hundred chairs. The area was set up to accommodate twenty some different rock and roll bands (cover bands) with radio hits from the 50s, 60s and 70s and there was a large dance floor right upfront by the speakers and it was specially lit for people who felt like putting on a show, and you know there are alwas quite a few of folks who relish any occassion to show off their trophy winning lifetime dance partners. The chairs were widely spaced and easy to access - free admission to the band shell - for people who just needed to sit down and take a breather. Indeed the whole show was rather spaciously planned and there was lots of potential for more activity and room to grow as they say in the events business. The food court however was one area that could be improved in my opinion. I didnt see a whole lot of food being offerend and maybe there was more there that I didnt see or smell but we looked for a good place to sit down and eat a meal and could only find beer gardens or stand up sandwich service. We didnt see any restuarant type venues that served proper meals and so we ate crepes at a breakfast nook where you could sit down and try and not get the syrup on your jacket. My crepe was made with a melody of fruits and I would write more but I'm not a food blogger, and this is a travel piece. There was unique beer parlors though at the side of the affair , and one opposite the exercise gyms looked like a Roman Garden with settes in which had folks could relax on resin wicker patio seating sets that were made available for use but also on sale with price tags; it was cool marketing and the furniture was both attractive and affordable. The annual Zoomershow is all about showing attendees how good they could have it in their Golden Years; it empowers attendees to make healthy choices and retire happy.